Afrofunk Music Forum - Daily news, music reviews and commentary on Afrobeat and related music from Africa, The Caribbean and The Americas. Afropop Worldwide - A Peabody award-winning radio program and online magazine dedicated to music from Africa and the African diaspora. Archive of Indian Music - Seeks to digitize and preserve for posterity the valuable slices of India's cultural history and musical heritage. The Archive has been set up in collaboration with the Manipal University's Manipal Centre for Philosophy and Humanities. 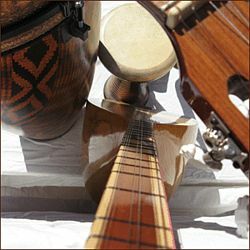 Brazilian Sound, The - Bossa nova, samba, axe music, and Brazilian jazz, with many good links. Crosspulse - Under the artistic direction of Keith Terry, since 1980 Crosspulse has produced dance and music works ranging in size from solos and duos to ensembles of seventy-five performers. Collaborations have included individuals and groups such as Gamelan Sekar Jaya, Rhythm In Shoes, Manhattan Tap, San Jose Taiko, I Wayan Dibia, Turtle Island String Quartet, Linda Tillery & the Cultural Heritage Choir, Geoff Hoyle, the Pickle Family Circus, and many more. Descarga - Provides hard to find back-catalog and independant label CDs, videos, books and instruments, Latin music database, and the Descarga Journal, an online magazine consisting of articles, interviews, profiles, and reviews. Specializing in Salsa, Latin Jazz, Timba, Rumba, Lucumí, Afro-Cuban, Bomba, Plena, Boogalú and more. Gil, Gilberto - Also read Wikipedia article. Havana Cultura - A window into Cuban creativity. JMI - Informing audiences with live performances, educational events and collaborative projects and to support musicians playing Jewish music across the UK. Kimock, Steve - Steve Kimock's compositions and playing draws upon a variety of styles, from blues to folk, jazz to Indian, African to psychedelic rock. Michael Masley - Cymbalom player of the first order. Naima Shalhoub - A first-generation Lebanese-American, Naima Shalhoub is a soul-singer, musician, songwriter, performer and educator. Also visit her blog, Diaspora Soul. Rhythms of Resistance - A drum band that plays at anti-capitalist demonstrations and direct actions. Rokia Traore - Malian contemporary music. Timba - New salsa music from Cuba. Veloso, Caetano - Composer, singer, guitarist, writer, and political activist. Called "one of the greatest songwriters of the century". Veloso is most known for his participation in the Brazilian musical movement Tropicalismo which encompassed theatre, poetry and music in the 1960s, at the beginning of the Brazilian military dictatorship. This webpage last updated on Thursday, November 29, 2018 1:54 PM.